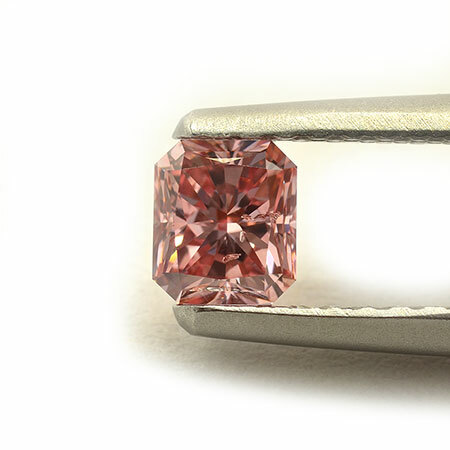 A spectacular 0.37 carat Fancy Intense Pink diamond. The cutter sagely chose to shape this gem into a Cut-Cornered Rectangle a wonderful choice to help bring out the rich bold pink hues. To make this stone even more impressive, it’s polish is categorized as ‘Very Good’ only a single step away from a perfect grade, truly a work of natural art. Pink diamonds are among the rarest diamonds in the world, the majority producer of pink diamonds (Rio Tinto) is closing it’s major mine (the argyle mine) in the coming years, halting the primary supply of new pink diamonds in the market. Those who follow diamond news know that this means the demand for pink diamonds will do nothing but skyrocket as time goes on.